Ask about the Prosser piano rental program. Produced in Ivoryton, Ct., in 1985, this Sohmer studio console piano is one of the finest hand made pianos in the United States. Sohmer pianos are built incorporating one piece legs which are dowelled into the shoulder of the cabinet. This studio console piano uses longer music wire, like a grand and has a full, rich tone. 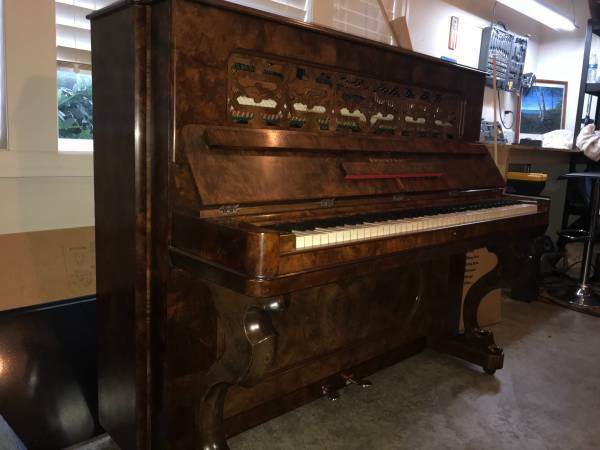 This hand made Sohmer piano has three working pedals, a "Boston" fallboard, and a matching hard top duet width bench that opens for music storage. ​One in home tuning within 90 days of local delivery is also included. "One owner, locally owned, solid wood, top tier quality"
a matching padded bench that opens for storage, and nickel plated tuning pins. It also has a hinged "Boston" fallboard. There are three functioning pedals, and the soundboard is shaped oblong, like that of a grand piano, ​for better escapement of sound. Pre-tuning and one in home tuning within 90 days of local delivery is also included. This beautiful European contemporary ebony polish Kawai console piano has the highest quality features, including a solid Sitka spruce soundboard, top quality hammers, 3 functioning pedals (including a practice pedal), and full length grand piano keys. Kawai shapes the soundboard oblong, like a grand piano for proper escapement of sound. This Kawai CX-5 console has a direct blow action, making this piano feel and sound great. The matching hard top bench and one in home tuning within 90 days of local delivery, are also included. This beautiful Steinhoff-Belwyn was produced in the United States. It has a standard fallboard, and is in very good condition. The extra wide matching padded bench has storage and opens. There are 3 working pedals including full sustain. This top of the line oak Kawai console piano has the highest quality features, including a solid Sitka spruce soundboard, over-sized top quality hammers, practice pedal, hinged "Boston" type fallboard, and full length grand piano keys. The one piece legs are dowelled into the cheeks of the piano for extra strength. Kawai shapes the soundboard oblong, like a grand piano for proper escapement of sound. Extra long strings, combined with a direct blow action, make this piano feel and sound great. Made in Japan, this high quality 45" Yamaha ebony satin studio piano has the best of features, including a solid Sitka spruce soundboard, high quality "Royal George" hammers, three functioning pedals, and full length grand piano keys. A hinged fallboard, combined with a direct blow action, make this piano the perfect piano for study and beauty. The matching opening bench and one in home tuning within 90 days of local delivery, are also included. This pecan Everett console piano was produced in Michigan, USA, in 1980. Everett pianos are extremely well built pianos, as the back posts are large and offset.. The legs are dowelled into the cheeks of the piano for extra strength. ​This fine Everett console also has a hinged "Boston" fallboard. ​The hardtop duet bench, which opens for music storage, is also included. Included is one in home tuning within 90 days of local delivery. This 1996 Baldwin Hamilton studio upright would make a great piano for study. In "excellent" condition, with a full size direct blow action, synchrotone wound bass strings, and a solid maple pin block, this piano will last for many more years.. The cabinet has braced legs for extra support, double rubber casters (for easy moving), and a standard fallboard. There are three functional pedals, and the original matching bench, which opens, is included. ​All of the hardware is durable brass​. Produced in the United States in 1999, this French Provincial cherry studio console piano is one of the finest hand made pianos of our day. Charles Walter pianos are built with the utmost attention to detail and are among the finest of the American made pianos. This studio console piano uses the same length strings as a grand and has a better sound than most full size upright pianos. This Charles Walter piano has three working pedals, a "Boston" fallboard, and a matching hard top duet width bench that opens for music storage. This top rated French provincial console was produced in London in 1964. It has grand piano length keys...Great for practice. The keyboard can be covered with a non-traditional folding type fallboard. This Knight console has high quality hammers, all spruce soundboard, and a massive matching bench. This beautiful mahogany polish 52" professional upright is stunning.. and has grand piano length keys...Great for the student. This fine Langlois & Sons professional upright has top quality hammer wool, an all "Ciresa" spruce soundboard from the Fiemme Valley in Italy, matching hard top duet width bench that opens for storage, and nickel plated tuning pins. The pedals are similar to those of a grand piano.. including a full sostenuto. The solid copper wound bass strings have agraffes, like a grand piano. Also like that of a grand piano, the soundboard is shaped oblong, ​for better escapement of sound. three functional pedals, and the originalmatching bench, which opens, is included. All of the hardware is durable brass​. This high quality 41" walnut console piano plays and sounds great. This fine Kranich & Bach piano was produced in East Rocester, New York, in 1971. It has a full size, all wood, direct blow action, hinged "Boston" fallboard, one piece legs dowelled into the cheeks of the cabinet, and 6 solid wood backposts. The sustain is long and clear. It has 3 working pedals, with a soft and full sustain. This crafted console piano has a matching hard top bench that opens. Made in the United States, this high quality 42" Yamaha oak console piano has the best of features, including a solid Sitka spruce soundboard, high quality Yamaha hammers, practice pedal, and full length grand piano keys. A standard fallboard, combined with a direct blow action, make this piano the perfect piano for study and beauty. ​make this 46" studio ​feel and sound like a grand piano. The matching bench and one in home tuning within 90 days of local delivery, are also included. This satin walnut Wurlitzer studio upright piano was produced in DeKalb, Illinois, USA. Wurlitzer pianos are some of the strongest constructed pianos, as the backs are composed of 6 oak back posts which enhance tuning stability. The legs are braced, and there are double rubber casters for easy moving. The music desk is large, and there are three functioning pedals. ​The hardtop duet bench, which opens for music storage, is quite large and braced. One in home tuning within 90 days of local delivery is also included. ​This is a piano that made the reputation of Steinway. It was acquired in already very good original condition with no missing or replaced parts. Even the bench is believed to have been with the piano since new. This beautiful Steinway upright has been restrung with new tuning pins,dampers,and new Steinway hammers.The case has been refinished in stunning semigloss lacquer, and all metal parts have been replated in original nickel. This is a piece of art, a bit of history, and a wonderful instrument that can be enjoyed for another 140 years. An investment that has proven better than stock market-will never lose value as it is only getting rarer to find these gems. "It plays like a new piano"
Used Kawai NS-20 professional upright piano. This stunning, 49" mohagony polish Japanese Kawai upright piano has the highest quality features, including a solid Sitka spruce soundboard, over-sized Japanese hammers, practice pedal, and full length grand piano keys. The legs are braced into the cabinet of the piano for extra strength and easy moving. Kawai shapes the soundboard oblong, like a grand piano for proper escapement of sound. Extra long strings, combined with a direct blow action, make this 49" professional upright piano ​feel and sound like a grand piano. ​a matching padded bench that opens. This very nice condition French provincial console has grand piano length strings and grand piano length keys...Great for practice. The keyboard can be covered with a folding "Boston" type fallboard. This Ridgewood console has high quality hammers, a practice pedal, all spruce soundboard, a matching bench that opens for storage, and cut threaded nickel plated tuning pins. This ebony polish 48" professional upright is not only beautiful, but has grand piano length keys...Great for the student. Built in 2000, this fine Bergmann professional upright has top quality hammer wool, an all spruce soundboard, matching hard top duet width bench that opens for storage, and nickel plated tuning pins. There is a deluxe mute rail, for quiet practice and the soundboard is shaped oblong, like that of a grand piano, ​for better escapement of sound. This top of the line 1969 Kawai console piano has the highest quality features, including a solid Sitka spruce soundboard, over-sized Imadegawa felt hammers, practice pedal, hinged "Boston" type fallboard, and full length grand piano keys. Kawai shapes the soundboard oblong, like a grand piano for proper escapement of sound. Extra long strings, combined with a direct blow action, make this piano feel and sound great. This beautiful rosewood polish 48" ebony polished professional upright has grand piano length strings and grand piano length keys...Great for the student. This fine Young Chang professional upright has Royal George hammers, a practice pedal, solid spruce soundboard, matching bench that opens for storage, and nickel plated tuning pins. The soundboard is shaped oblong, like that of a grand piano, for better escapement of sound. This mint condition 52" ebony polished deluxe professional upright has grand piano length strings and grand piano length keys...Great for the student. This fine Kohler & Campbell has double wrapped Royal George hammers, a practice pedal, solid spruce soundboard, matching padded bench that opens for storage, and nickel plated tuning pins. Pre-tuning and one in home tuning within 90 days of local delivery are also included. This pre-owned, ebony polish, 52" Japanese Yamaha deluxe professional upright piano has features similar to that of full size grand pianos, including a solid Sitka spruce soundboard, oversized Royal George hammers, practice pedal, and full length grand piano keys. Yamaha uses "Acoustibars" to shape the soundboard oblong, like a grand piano. Extra long strings, combined with a direct blow action, make this piano feel and sound like a grand piano. The matching padded bench and one in home tuning within 90 days of local delivery are also included. This walnut Kimball Artist Console was produced in the United States in 1978. It is a full 42" in height, with a direct blow action, and, has a "Unilock" back construction. The extra wide padded bench has storage and opens. There are 3 working pedals including bass sustain and a brass kick plate. Pre-tuning and one tuning in the home are included with local delivery. Made by hand in the USA, this walnut full size upright piano is "As Is". This piano is for the "Piano Fixer" or learning technician. No warranty, no returns, "As Is" . No holds. 1st come, 1st served. Prosser Piano Services is a complete piano service department. Whether you need a piano tuned or an heirloom restored, Prosser Piano Services is equipped to handle virtually any job to your satisfaction.